NEUTROGENA® NORWEGIAN FORMULA® Foot Cream is a dermatologist-tested cream that provides prompt relief for even seriously dry, rough feet. This concentrated skin care formula delivers a full day's moisturization with every use. Used daily, it restores skin softness and helps keep the cracked or dry patches from coming back. Just a small amount leaves feet feeling noticeably softer and smoother. 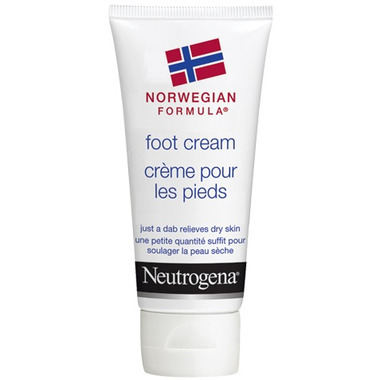 Neutrogena Norwegian Formula Foot Cream is the ONLY foot cream that gives my dry feet the moisture they need! I highly recommend it. This product is absolutely amazing! Itâ€™s moisturizing without feeling greasy, absorbs into the skin quickly, and a little bit goes a long way! Iâ€™m excited to try other products from this line! Not the best foot cream I've ever used. I'm currently using it as a hand cream and it works great! I find this foot lotion to be far superior to the multitude of others I've tried. A little goes a long way and continued use keeps feet nicely moisturized. Can be hard to find at local pharmacies and mass market retailers so I'm glad to have found it at Well - just bought two tubes of it. Works very well on dry areas on feet. Not greasy and noticed a significant improvement after 5 to 6 applications. I have been importing this from the UK since I moved to Canada. So pleased to find it here now. It is by far the best foot cream around - (I have tried many). If you have very dry heels or feet with calluses, try the Norwegian formula foot cream by Neutrogena in the evening before bed and in the morning. As I am a diabetic, this cream has really helped my dry, cracked heels so much. In fact my heels had gotten so bad over Winter I was having a lot of trouble even walking on them. This cream worked beautifully, at a reasonable price! It has taken me awhile to find this excellent product ... it works magnificently!! This is a great product. I have been using it for years. This product does not have na nice smell, good thins it's on my feet. I agree with others -- it's the best foot cream I've found, and I've tried many over the years. Some smell wonderful; this one doesn't have a scent but works so much better than the rest. love this product! tiny amount works very well to soften skin - great for getting boyfriend to rub my feet!! Simply the best foot cream on the market. Excellent product. Agree with everything that has been said by others. I was thrilled to find it at Well.ca because I had been looking to replace my old tube and couldn't find it in the stores. The non-greasy cream immediately makes your feet and toes look baby smooth wirh that just after a pedicure appearance. It also has a slight lovely scent. A1 product. Kudos to Well.ca for carrying it. ! Love this cream! Softens your feet immediately without any greasey residue. Well worth the price as you only need a small amount for it to work. Would definately buy it again. Wow, what a great cream. I have tried so many and this one is the best. You only need a small amount, and it absorbs quickly, so you don't have to worry about slipping and sliding. I noticed a difference very quickly. Excellent product that allows me dank heels to come back to life! This cream is fantastic. A tiny bit goes a long way and hydrates the toughest and driest skin of your feet. It's a high quality product at a very reasonable price. Unfortunately (or fortunately for Well.ca! ), they don't seem to carry it in my local pharmacies.